AVG Protection is our best antivirus, anti-malware, and anti-spyware package for you and your entire family. You get our best protection for unlimited Windows PCs/tablets, Mac computers, and Android phones/tablets. You also get Anti-Theft to remotely find, lock, or wipe your Android devices if they ever go missing. AVG Zen technology is built into each product, too, allowing you to extend your security to unlimited family members and remotely protect all their devices from any Windows PC or Android phone/tablet. At no additional cost! Best of all, we're constantly evolving our products, and your subscription will be automatically updated with improvements or new features. AVG Protection includes the following software for UNLIMITED personal or household devices: AVG Internet Security for Windows: Our best malware and spyware protection for Windows PCs or tablets gives you safer online shopping and banking, enhanced privacy, and real-time security updates. Now with Real-Time Cloud Detection to help instantly spot new malware outbreaks and better protect you against malicious websites! AVG Antivirus PRO for Android: The first antivirus app to reach 100 million downloads on Google Play. Also includes Anti-Theft so you can remotely find, lock, or wipe your phone or tablet if it's ever lost or stolen; Camera Trap to see who's stolen your phone; App Lock to protect private apps and photos; and more. AVG Antivirus for Mac: Real-time malware protection and triple protection against Mac, PC, and Android threats. Now with quarantine to isolate infected files from the rest of your Zen: Allows you to extend your security to unlimited family members and remotely protect all their devices from any Windows PC or Android phone/tablet. Trusted anti-virus for every device you own. 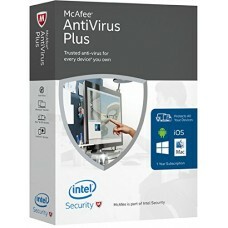 Overview: McAfee Antivirus Plus service provides basic ..
AVG Ultimate is our best all-in-one antivirus, anti-malware, privacy, and tune-up package for you an.. Award-winning antivirus security for your Windows desktop, notebook or tablet. Detects, blocks, remo..